828 Mk2, FireWire audio interface from MOTU in the 828 series. 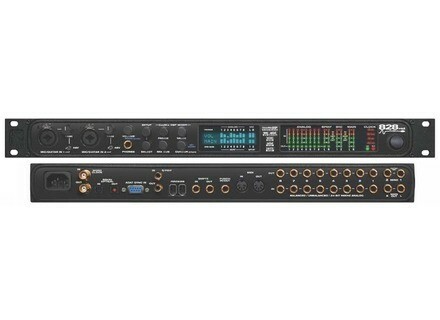 Product replaced by the MOTU 828 mk3 Hybrid. The MOTU 828 MK2 is a 14 x 10 audio and MIDI interface designed for the home studio DAW that will support up to 96 kHz. For such a little unit, it’s actually got a good amount of versatility and options. It’s a firewire based unit, consisting of two ports. There are two microphone preamps, each of which have dual ¼”/XLR jacks and trim knobs, built in phantom power, and a pad for each as well. As far as other connections go, it has six other ¼” inputs, eight ¼” outputs to correspond with each of the inputs, and ¼” main stereo outputs for sending your sound to your monitors. It also has a MIDI input and output and the same for S/PDIF as well. There’s also a ¼” jack for a headphone input and metering is done with the LED screen on the front panel. It’s powered by either your computer via bus power, or with a nine volt power supply. The 828 MK2 is also rackable. As long as you understand the characteristics and features involved here, you’re going to be able to operate the 828 MK2 without any issues. Everything is pretty straight forward and direct once you understand all of the connections and features here. Of course if this is your first audio interface, you might want to have the manual around to help you understand all of the basic components here. The 828 MK2 is overall a very clean sounding unit, from the preamps to the overall playback quality through the converters. Especially considering that this is meant for portability, the sound is quite sparkling clean. The preamps aren’t necessarily the best sounding in the world, but they do have a decent amount of depth to them and will definitely get the job done for remote recording or for work in a smaller home studio. As far as small/portable audio interfaces go, the 828 MK2 has as much flexibility crammed on this little unit as any I’ve used before. It will definitely work in your home studio if you want a little audio interface to run your DAW on, but I think it would work best as a supplemental unit for recording on the go. I don’t own this audio interface myself, but a friend of mine has it for his home studio and uses it all the time for recording on the go, which is really a great thing to be able to do. MOTU has some great audio interfaces in all different price ranges and for different purposes, so if the 828 MK2 doesn’t do it for you, definitely check out the others that they have to offer.